If you missed it, here's In Depth: Transitions: Part 1: Basic Editing Terminology and A Brief History of Transitions. This article focused on editing technique and the basic cut, dissolve and wipe, as well as showing some examples thoughout film history. 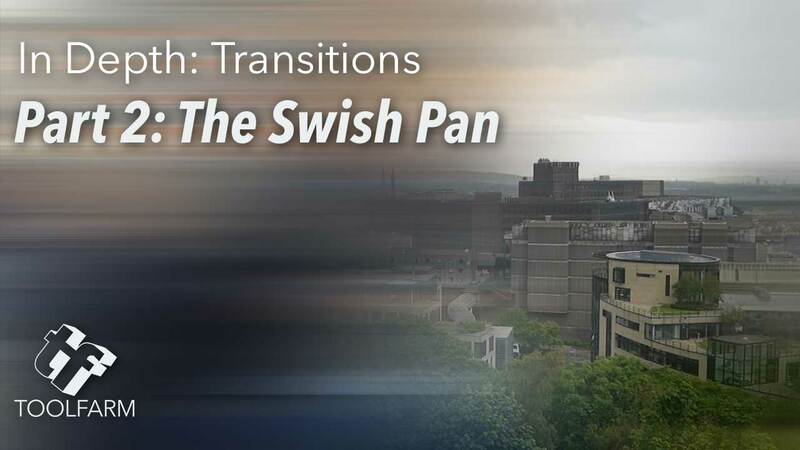 I went into each of those transitions in depth and now it's time to do the same for swish pans. By definition a swish pan or whip pan is “a type of pan shot in which the camera moves sideways so quickly that the picture blurs into indistinct streaks. It is commonly used as a transition between shots, and can indicate the passage of time and/or a frenetic pace of action.”1 The swish pan is an abrupt effect that is fast paced and brings energy to a sequence. Note: There are blur dissolves which utilize a horizontal or vertical motion blur but they're not considered swish pans unless the video moves with the motion blur. I'm grouping these transitions together because they're pretty much the same thing, just from different planes. If you're new to this field, here's a bit of film terminology to help you break it down. Zoom: camera moves towards or away from an object, such as a close-up shot to a wide shot or a wide shot to a close-up (Z axis). Couple those camera moves together with a quick transition between two shots and add some motion blur, and you have a swish pan transition (or whip tilt, or blur zoom…). Let me make it clear right up front that you can create this transition with the native effects in pretty much any host. The benefit of using a plug-in over a home brew is that it's easier, faster, and some plug-ins give you extra options to increase your cool factor. I'm going to start this article with a tutorial because Greg at Videomaker does such a nice job explaining the Swish or Whip Pan transition and how to get great results. His example is exactly what a swish pan should look like… and not all of the other examples on this page are this good! He uses Premiere Pro and builds the effect from scratch but the concept is the same, no matter which NLE or plug-in you're using. In this article I'm mainly focusing on the pan and tilt type of swish pan – the true swish pan, if you will – but if you're interested in a zoom style transition, I'd recommend checking out bigger bundles such as Boris Continuum Complete, GenArts Sapphire, NewBlueFX Transitions, and Noise Industries FxFactory Pro. Let's get this started with a bit of fun. Ben Brown uses a lot of quick swish pans in his vlog and it works really well. They help move things a long and add to the excitement. 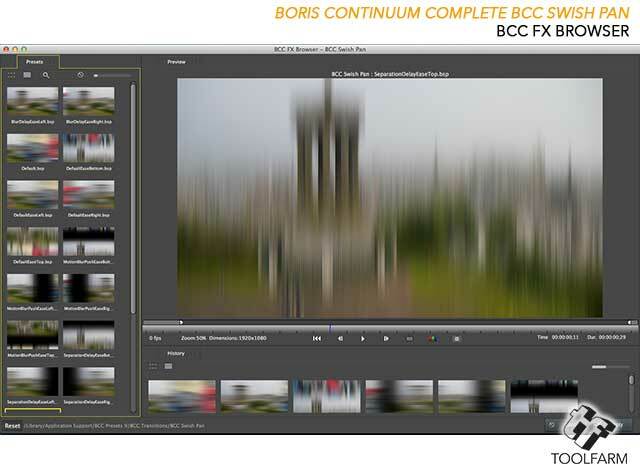 The first swish pan plug-in I got to know is the BCC Swish Pan, included in both Boris Continuum Complete and the Boris Continuum Unit: Transitions. BCC Swish Pan is very easy to use and it comes with several useful presets. 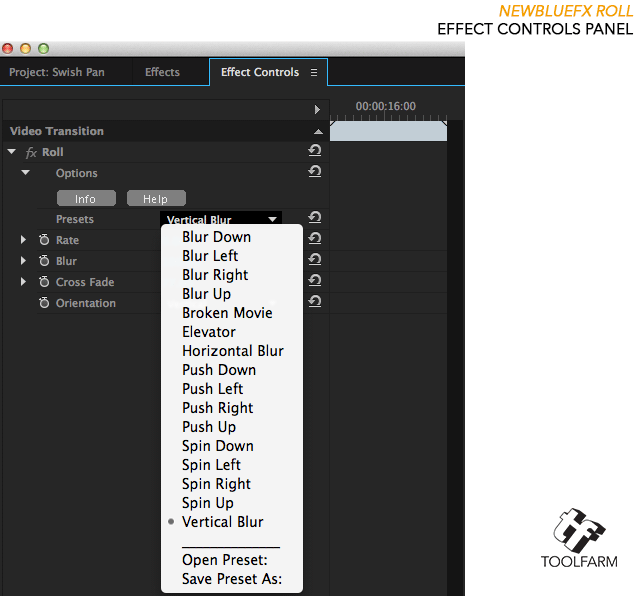 The best part is that you can preview the presets in the BCC FxBrowser. The BCC Swish Pan interface in Premiere Pro has the same features as the interface in other host applications. There are options to Auto animate the animation, or enter it manually by keyframing Percent Done parameter. In After Effects, I prefer to enter the percentages but in Premiere I really like setting it to Auto, to animate over the duration of the transition. The BCC FxBrowser is a separate app that launches from each host app when the FxBrowser button is launched. It allows users to preview the presets on moving footage. One thing that would be nice to see in BCC Swish Pan is the ability to rotate the swish transition on a diagonal. 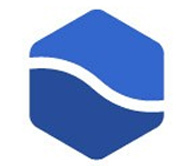 NewBlueFX Roll transition is included in both NewBlueFX Transitions Ultimate and NewBlueFX Total FX. 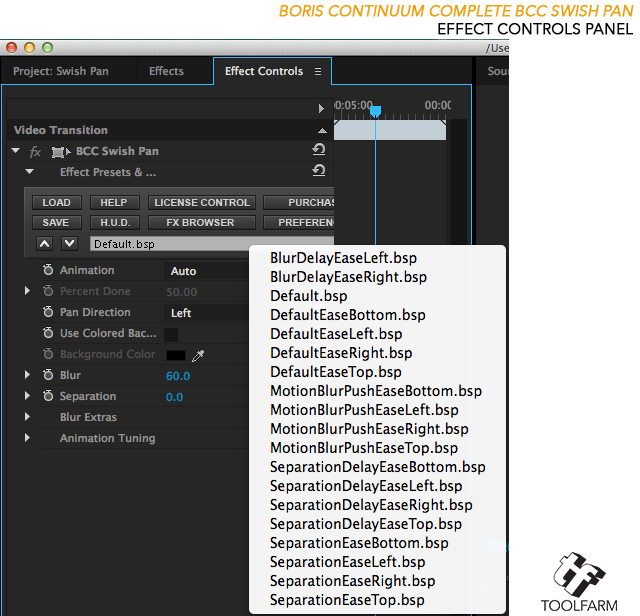 Here's an example of the NewBlueFX Roll transition which is included in both NewBlueFX Transitions and NewBlueFX TotalFX. The transition works in Premiere Pro, Sony Vegas, Avid, Final Cut Pro and several other hosts. It doesn't show up in After Effects. Check the system requirements for specifics. Roll has several interesting presets, including spin transitions. The Orientation of the transition can be changed as well. GenArts Sapphire S_SwishPan is an elegant swish pan effect that works in several host application. There are several other parameters to choose from, and of course, the nifty FxBrowser included in Sapphire 8. Just click the Load Preset button which brings up the Preset Browser. 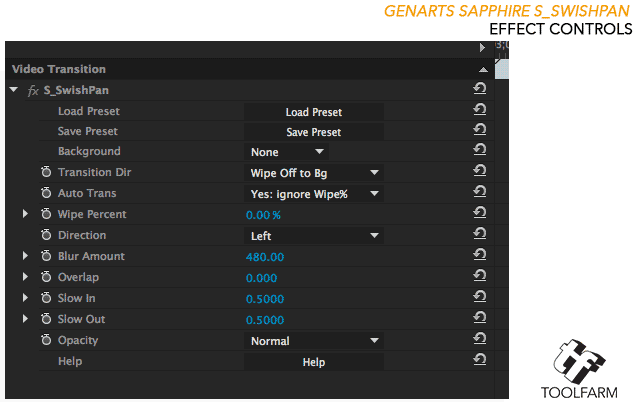 As with all of the Sapphire 8 plug-ins, you have the option to create and save your own presets. Click Save Preset and a dialog box will pop up. With S_SwishPan you'll need to set the Background to the layer you want to swish to or it will just transition to black, great if you want to transition to black. Next is Transition Dir, a popup menu that allows you to chose if you're wiping the layer on or off. 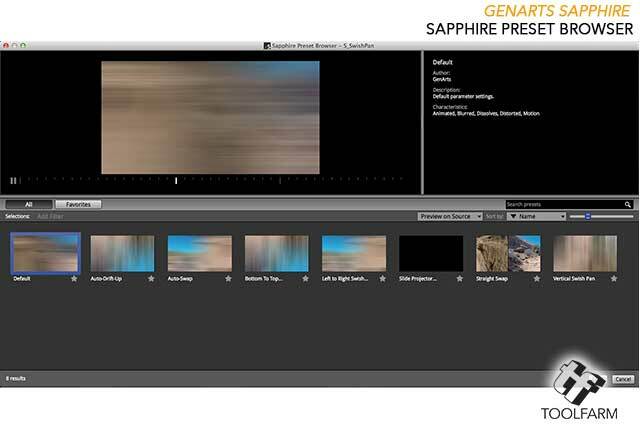 Sapphire transitions have the option of auto-animate or being keyframed. In Premiere, I am all about auto-animating, but in After Effects, I prefer to keyframe the Wipe Percent parameter. To set this up in Sapphire, under Auto Trans, choose Yes or No. If it's enabled, the transition is automatic. If it's Off, you'll need to keyframe the other parameters. Direction is the parameter for which way the clips move during the transition. The options are on the x and y axis (Left, Right, Up, Down), so no angled wipes are allowed. The Blur Amount is the amount of motion blur on the transition. Overlap is the amount that the two clips overlap. Slow In and Slow out are settings to ease the effect in our out. Opacity is pretty obvious. 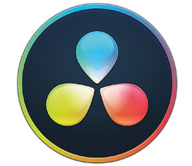 CineFlare Hand Held is a plug-in for Final Cut Pro X and works on the FxFactory FxEngine. It allows users to take locked-down footage and add interesting effects like whip pans, various lens focuses and zooms, and shakes, bumps, and jitters. 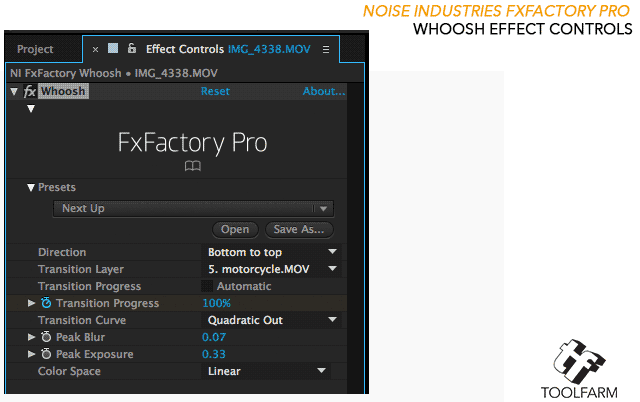 Whoosh is a nice little swish pan transition in the FxFactory package. It runs in Final Cut Pro X, Motion, Adobe After Effects and Adobe Premiere Pro. It comes with 4 presets and it works a lot like the others in this article. One feature that this plug-in has that others don't have is the option to adjust the exposure during the transition. You can adjust Peak Exposure positively for a lightened transition, or set it to a negative value for a darkened transition. 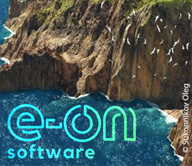 Andy's Swish Transitions is built on the FxFactory FxEngine and is a free download for Final Cut Pro, Motion, After Effects and Premiere Pro. It has no presets, but has several parameters such as Pan Direction, Whip Factor, which is how strong the effect is, and Transition Timing, which are Ease Controls. A Transition Layer can be chosen to pan into and, like BCC Swish Pan, the Transition Progress can be Automatic or manually keyframed with percentages. If you want to create some swish pans but don't want to use plug-ins, here are a few tutorials for After Effects and Premiere Pro. 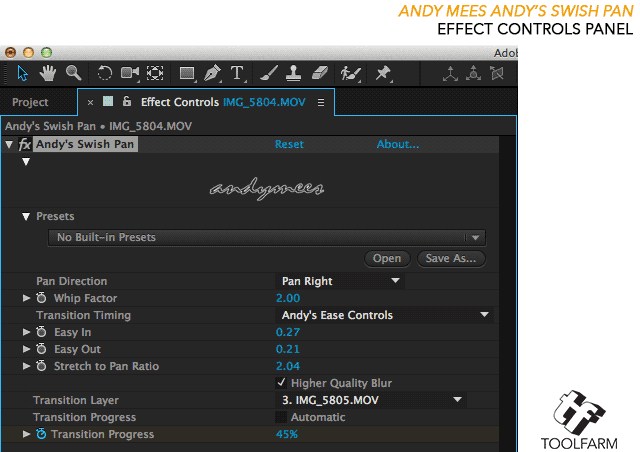 The Mumbo Channel explains how to build the transition in After Effects, sans plug-ins. Another variation on creating a whip pan in After Effects from MotionMile. Ann Bens' tutorial explains how to create your own whip pan in Premiere Pro. Also, check out the text version of the tutorial over at Premium Beat. The 321 Show has a very young teacher, but he knows his stuff. He calls this Whip Pan Transitions Aka Ben Brown/Casey Neistat Transitions. One of Ben Brown's videos, Beautiful London, was embedded above. This tutorial uses Premiere Pro. Rich Young did a Whip (swish) pans in After Effects & Premiere round up a couple of years ago over at ProVideo Coalition. 1 Whip pan transition, Wikipedia.